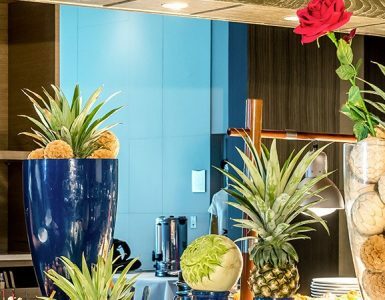 If you’re looking for the best hotel deal in Bangkok including the best price, a prime location, renowned restaurants as well as comfortable accommodation with the best facilities, Novotel Bangkok Platinum Pratunam is definitely THE place for you. You will never choose to stay anywhere else but here with us as you will receive the best room rates no matter what type of room you prefer: Superior Room, Executive Room or Executive Suite. Give yourself the treat of booking a room on our Executive floors, with higher views, upgraded in-room amenities and the exclusive privileges found at the Premier Lounge on the 24th floor. Benefits include all-day refreshments, private buffet breakfast, VIP check-in/check-out as well as our popular evening happy hour. The relaxing infinity pool with stunning panoramic views of Ratchaprasong area from the 9th Floor is another favorite spot for our hotel guests. You can also take in the view while you work out at In Balance fitness centre with its top-notch equipment. A massage service is also available to help soothe and refresh. Worked up an appetite? Our buffet deals are popular with savvy gourmands, thanks to discounts up to 50% with selected credit cards and Accor Plus card holders and a large selection of delicious food and desserts from around the world for breakfast, lunch and dinner. You can even choose what kind of buffet you like: seafood buffet, known as the best brunch buffet in Bangkok, Completely Crab Dinner Buffet, and more! No matter what you choose, we’re sure that you will have an enjoyable and satisfying meal at The Square. This hotel is also in one of the city’s prime locations. 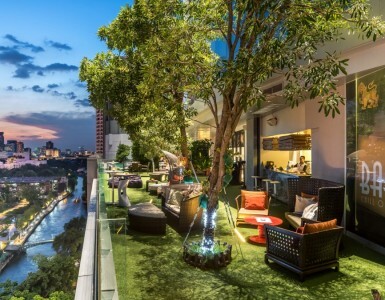 Right in the heart of the buzzing business and shopping area in Bangkok city, this convenience makes your stay easier and more pleasant than anywhere else. You can choose different modes of transportation to travel around Bangkok e.g. taxi, sky train, buses, Tuk-Tuk and even the ferry service nearby the hotel. Obviously, thanks to all the reasons above and more, Novotel Bangkok Platinum Pratunam is the best hotel deal in Bangkok! Book your stay with us and you’ll understand why it’s a lot better at Novotel.